Step 4: Make sure you measure for the cut in the worktop precisely. Do this by placing the sink upside down and in place on the new worktop. Then draw a pencil line carefully around the edge. Step 5: Remove the sink and draw a second, more prominent line inside the first line. This is to accommodate the lip of the sink. In most cases, the lip is 19mm. Step 6: Drill an access point for the jigsaw blade with a 12mm drill bit just inside the lip line. Then cut carefully all along the line using your jigsaw. Step 7: With the cut complete, you are ready to fit the sink. Start by sealing the cut edge with PVA; this will not be visible, and will give the naked edge some resistance against moisture. 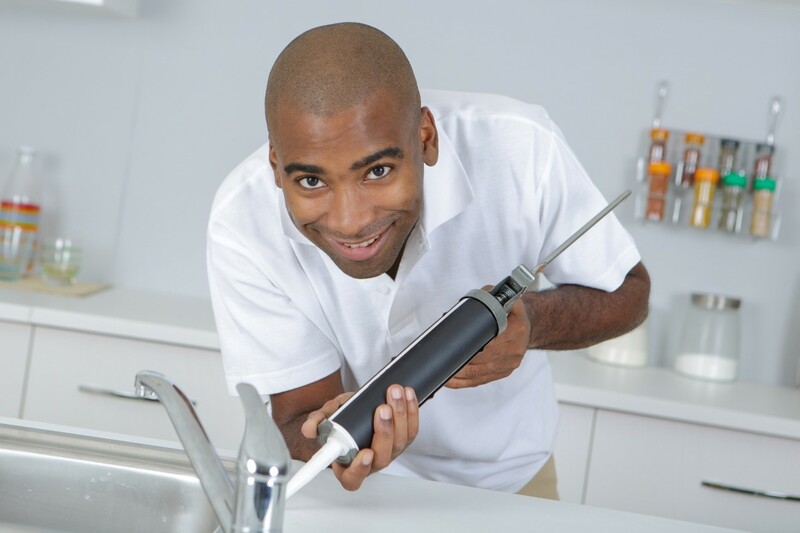 Step 8: If the sink came with a rubber seal, attach it to the lip, alternatively use a silicone specifically formulated for use in the kitchen to seal between the sink and worktop. Step 9: Put the sink in place and tighten the securing clips from under the sink. To ensure a watertight seal, put more silicone around the edge and clean any excess with a clean cloth dipped in spirits.